This week a group gathered on the steps of Parliament to protest against one of the most disturbing pieces of legislation to come from the National Government – the amendment to the Health and Disability Act 2013. For the past decade families have been fighting for the right to be treated equally under the law and be paid as caregivers for their work to look after their family members. Finally the Human Rights Commission had recognized the basic fact that not paying, or paying family members less for caring for their disabled kin was discriminatory. It is discriminatory both to the families of disabled people, and to disabled people themselves, stopping them from having who they want to care for them. The National Government’s response was disgusting, passing a bill under urgency that only allowed family members to be paid the minimum wage (less than non-family caregivers receive) and capped the number of families who could get paid completely arbitrarily. On top of this, they wrote into the legislation that nobody was able to complain to the courts about this policy in terms of discrimination. 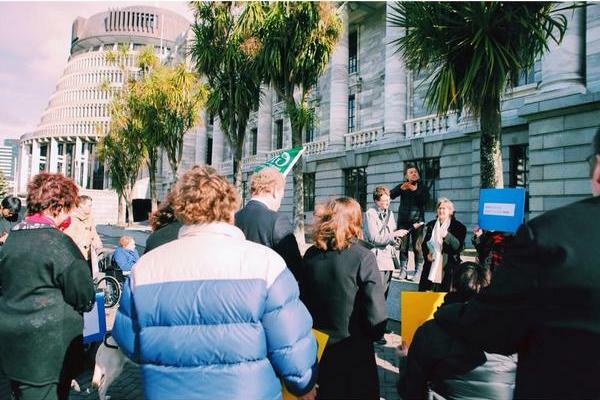 This protest, organised by the Disabled Persons Assembly (www.dpa.org.nz) stood up against the National Government’s appalling treatment of disabled people, and presented a petition against the bill. Speakers included people from disabled persons organisations, families who had been cheated by this bill, people from the law community, and the Green and Labour parties. The rights of disabled people are continually ignored and pushed off to the side in politics, and this is disturbing, especially considering the discrimination disabled people experience in Aotearoa today. This protest may only have been symbolic, and it is far too easy for National to ignore, but with more protests like it and more flaxroots movement, we can push for a community that respects the rights of everyone.